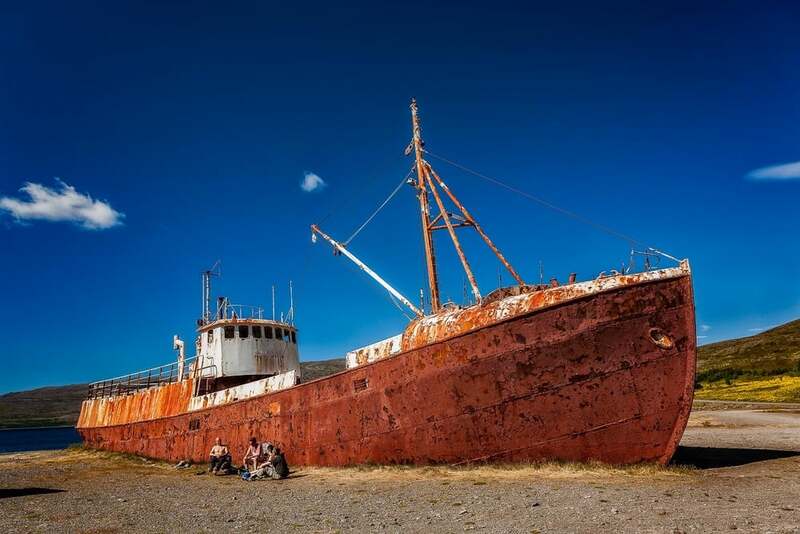 A surreal scene showing some local folk enjoying the sunshine, in front of a beached ship, on a beautiful summer's day in northern Iceland. Are you searching for simple ways by which you can make better photos, more often? Here's 7 tips to help you dramatically improve your photography and, as a result, significantly increase your success rate and the amount of keepers you'll be able to bring back from your upcoming travels. Put simply get in the habit of photographing people, landscapes, wildlife and architecture that are interesting to you and to your audience. But subject matter is just the beginning of the process. A rock is a rock, is a rock. But a rock can also allow you to explore shape, texture, color, surface, hardness, age, stability, time (i.e., via erosion), contrast, shadow, etc. As you can see in the above photo, humor and the unexpected also grab and sustain viewer attention. Also the time of day you make your photos can dramatically increase your success rate. There's no co-incidence that photos made early or late in the day often rate highly with audiences. The soft, warm light at those times of day enables the production of photos with a more highly emotive quality. 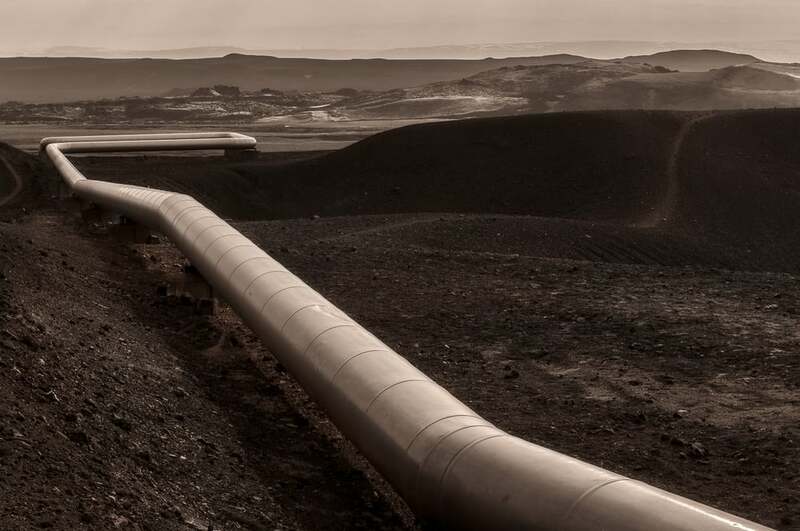 A large pipe transfers steam through the landscape near the Viki Crater not far from the town of Myvatn in Northern Iceland. Now that doesn’t mean you can’t make great photos of what many would consider uninteresting or banal subject matter. That’s a challenge I revel in, but I need first to be attracted to that subject or scene, and it’s usually the way that subject is lit that draws my attention. I write a lot about the transforming, transitory and transcendental nature of light. Most importantly, light provides a glimpse into the sublime nature that connects all things. Most of our photography should be as much about light as it is about subject matter, story, theme, etc. After all the word photography comes to us from Ancient Greek. Photo means light and graphy means writing, drawing or painting. The serenity was palpable as the sun set on Jokulsarlon Glacier Lagoon in Iceland. The contrasting warm of the sunset and the cool blue of the iceberg and lagoon provided a striking contrast. Get up high or get down on your haunches, even lie flat if that’s what’s needed to provide you with an interesting or dynamic perspective. When it comes to portraits the way people are represented in a photograph (e.g., powerful, equal, vulnerable or cute) has a lot to do with the position of the camera in relation to the subject. Most people do not think to change their angle or perspective on a subject, so too often we're looking down at small subjects and looking up at large (i.e., tall) ones. Try monumentalizing a small flower by moving in close, getting down on your belly and photographing up so as to make it look larger than life. Alternatively, climb a tree or photograph from a rooftop, though in each case do so at your own peril. Stay safe, don’t go where you're not supposed to be and avoid overly aggressive confrontations with security staff. You’ll only make things worse for the next person wanting to photograph in that location. The key point is to get out of the habit of just walking up to something or someone, pointing the camera and going click. And don’t say smile or cheese automatically when making a portrait. Some portraits are more powerful when obvious expressions and poses are discarded. Whether you’re a working professional photographer or an enthusiast, variations in perspective are a key way by which you can separate the photos you make from the rest of the pack. Ripples create a series of concentric patterns, surrounding floating ice, on the surface of the Jokulsarlon Glacier Lagoon, Iceland. The next time you see a mountain, monument or building you want to photograph try to think of how you can better explore your response to that place or object through juxtaposition. The inclusion of a visually interesting subject in the foreground may help create the feeling or concept you're trying to communicate. For example, a mountain will look particularly large when a person is placed in front of it. This simple technique adds a sense of scale to the photograph and, thereby, helps us tell the story we want to tell. Photos of a companion trekking (e.g., hiking, tramping) in the awesome grandeur of the Himalayas is a great example of where to use this technique. Want a grant from an arts council? Make sure you include the word juxtaposition in your proposal. I kid you not. A neat variation on the theme, commonly employed by landscape photographers, is to include something small in the foreground in contrast to a large mountain in the background. Your foreground subject needs to be interesting and recognizable, so look for something that’s colorful, well lit and, ideally, incorporates the compositional elements of shape and texture. Let’s say you choose bright yellow flowers as your foreground subject matter. Get down low and move in close to the flowers to make them appear larger than life. By employing a wide-angle lens the flowers will look far larger than life, providing you’re photographing them up nice and close and, as a consequence, the mountain will look much smaller and further away than it would if photographed with a normal or telephoto focal length lens. 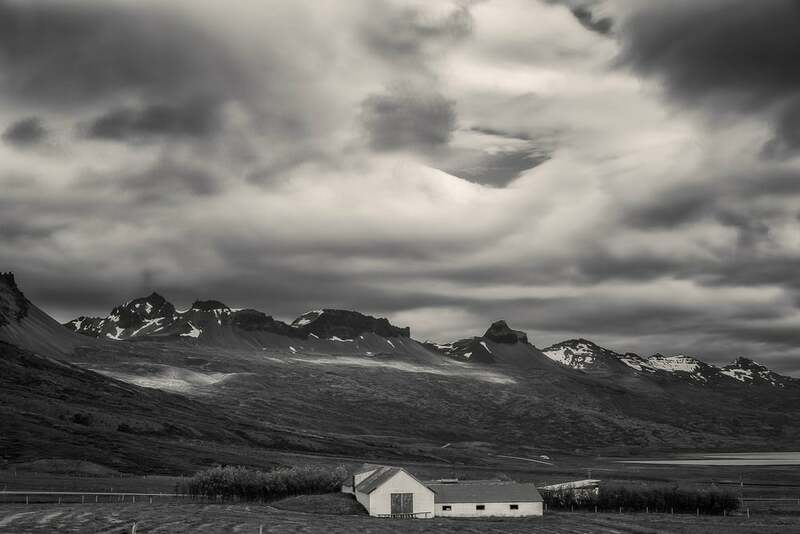 Farm buildings set amidst a beautiful landscape and a stormy sky in rural Iceland. Have no doubt photography is a physical endeavor. The more active you are in working to find interesting angles or better lighting the better your photographs are likely to be. Moving changes the relationship between foreground and background elements within the frame and, in conjunction with different focal lengths, allows you to explore perspective in unique ways. If things aren’t going well, move. To be more specific move the subject and/or move yourself. In environments where studio or off camera strobe (i.e., flash) lighting is being employed you have a third element to consider moving: the light. A dry dirt road winds its way through beautiful mountain scenery in rural Iceland. These days folks talk a lot about the need to introduce story telling into their photography. But, with all due respect to Goldilocks, we are not, necessarily, talking about a series of images that tell a story through a linear progression. For example, he got up, he showered and combed his hair, ate some breakfast, ran to catch the bus, etc. By the way, since the notion of juxtaposition and storytelling have become so dominant in this particular post, check out the song A Day In The Life by the Beatles. You’ll notice how Lennon and McCartney brilliantly weave a series of unconnected narratives, linear and otherwise, into the rich soundscape of that most amazing song that, I hope, we all know and love. Look for something that tells the story of the place, such as a river leading into the scene or boulders that are slowly falling off the face of the mountain and are destined to become pebbles at the bottom of a stream, far below. We are always looking for the perfect photo, but one thing many pros do is to tell a story through a short series of quite different images. To do so you begin to work closer to the way a photojournalist might, which is a lot of fun. This mentality encourages a closer look, from photographer and viewer alike, at what makes a particular place different and unique. People, animals and scenery can all tell a story, and the combination and interaction between these elements define the culture and topography of a place. 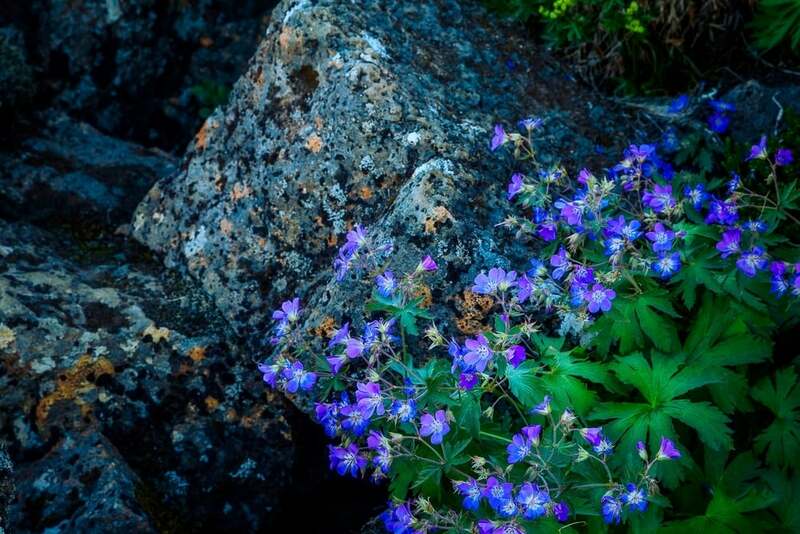 Colorful wildflowers growing alongside volcanic rock at Thingvellir in Southern Iceland. As well as trying to photograph your response to the larger scene look for individual elements within that environment to photograph. By exploring some of the details that make up the greater landscape you’ll discover opportunities for great imagery you may otherwise have overlooked. It’s quite possible that you’ll end up with a range of images that can stand-alone from each other and be shared or displayed in a variety of different ways. But you’ll also end up with a series of photos that, when placed together in a well edited and cohesive series, tell a story that’s far richer and visually more interesting than a single image. When it comes to traditional forms of publishing, you’ll usually be paid more for a series of images than you will for a single one, except in the case of a cover photo. One thing that makes a photo great is when the main subject seems to jump off the print, page or screen. When you really take the time to scrutinize why certain photos are more powerful you’ll discover, in most cases, that the separation between the subject and the background makes all the difference in the world. Visual separation can be achieved through differences in relative contrast (e.g., tone or color), subject matter and focus. Having awareness of your background plays an important role in the process of constructing a great image. For example, a black dog photographed against a black background will lose impact. However, that same dog photographed against a much lighter background will lift the dog out of the background and push it forward. Dark tones advance, while light tones recede. Similarly, photographing a red rose against an orange colored background, of a similar brightness to the rose, will result in a fairly flat, visually compressed image. If you’re looking for a more visually arresting image you’d be wise to place that same red flower against a background at the opposite end of the color wheel. For example, place the red rose against a cyan or blue wall. Juxtaposing opposites is the name of the game. As well as the examples mentioned above consider how different subjects can also introduce visual separation in an image. Bride and groom, loved and reviled, young and old, rich and poor, short and tall, etc. A puffin with a mouth full of fish rests on a cliff face in Iceland. Perhaps the most obvious form of visual separation is achieved through the use of a shallow depth of field. By critically focusing on your primary subject and employing a shallow depth of field you’ll be able, under the right conditions (i.e., a fast/wide maximum lens aperture and a camera to subject distance that's considerable less than the distance between the subject and background), to produce particularly striking results. Shallow depth of field is one of the techniques that separates a professional portrait photographer, or an enthusiast that makes professional looking portraits, from a typical snap shooter. Remember to be aware of your surroundings and adjust your composition; lens and camera settings; and the camera to subject distance to make the most of your subject and, where appropriate, their relationship with their environment. And, of course, don’t forget light. Timing (i.e., The Decisive Moment) can be as critical to the success of a photo as interesting subject matter, great composition and sound technique. But, for me, light is, more often than not, what it’s all about. All of the images in this post were made during an extensive trip I undertook to Iceland. I travelled all the way around the island and also explored some of the interior Highlands region. Iceland is a spectacular country, a mecca for landscape photography, which is why I'm very excited about returning, hopefully during 2019.